Posted on 6, October 2016 by EuropaWire PR Editors | This entry was posted in Education, Healthcare, Science, Switzerland and tagged Douglas C. Dean, Jonathan O’Muircheartaigh, Monique LeBourgeois, Peter Achermann, Reto Huber, Salome Kurth, Sean C. L. Deoni, sleep deprivation, Sleep deprivation in children, University of Zurich. Bookmark the permalink. A team of researchers from the University of Zurich has studied the effects of acute sleep deprivation in children for the first time. They discovered that the brain in five to 12-year-olds responds differently to sleep deprivation compared to adults: The reduced amount of sleep leads to an increased need for deep sleep in maturing areas of the brain. This affects posterior regions of the brain, which are involved in vision, spatial perception and processing multi-sensorial input. ZURICH, 06-Oct-2016 — /EuropaWire/ — Sleep is vital for humans. If adults remain awake for longer than usual, the brain responds with an increased need for deep sleep. This is measured in the form of “slow wave activity” using electroencephalography (EEG). In adults, these deep-sleep waves are most pronounced in the prefrontal cortex – the brain region which plans and controls actions, solves problems and is involved in the working memory. The team of researchers also discovered that the heightened need for sleep – measured as an increase in deep sleep – in children is associated with the myelin content in certain nerve fiber bundles: the optic radiation. This brain region is part of the visual system responsible for spatial perception and processing multi-sensorial input. The level of myelin – a fatty sheath around the nerve fibers, which accelerates the transfer of electrical signals – is a yardstick for brain maturity and increases in the course of childhood and adolescence. The new results now reveal that the higher the myelin content in a brain region, the more similar the deep-sleep effect is to adults. In order to study the effects of sleep deprivation in children a collaboration was launched with the University of Colorado Boulder (USA). 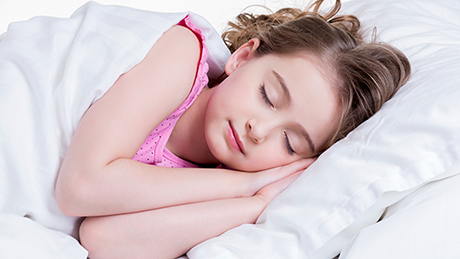 The sleep researchers measured the brain activity in 13 healthy five to 12-year-olds as they slept. The EEG measurements with a total of 128 electrodes were conducted twice overnight at home with the families. On the first occasion, the children went to bed at their normal bedtime; the second time, they stayed awake until late and thus received exactly half the normal amount of sleep. The scientists also determined the myelin content in the brain with the aid of a recently developed, non-invasive magnetic resonance imaging technique. “Our results show that the deep-sleep effect occurs specifically in a particular region of the brain and is linked to the myelin content,” sums up Kurth. According to the researcher, this effect might only be temporary, i.e. only occur during sensitive developmental phases in childhood or adolescence. The scientists assume that the quality of sleep is jointly responsible for the neuronal connections to develop optimally during childhood and adolescence. Consequently, it is important for a child to sleep sufficiently during this life phase. According to international guidelines, the recommended amount of sleep for children aged 6 to 13 is 9 to 11 hours per night.